People visiting your website are likely to want to hear from you as they are interested in your products or services. By embedding a data capture form prominently on your website you can build a database of subscribers who are genuinely interested in hearing from you. Every Sign-Up.to account includes tools to create a data capture form with its own unique URL. The code you will need to insert can be found by logging into your Sign-Up.to account and navigating to 'Forms' under the Collect tab. Click on the icon of the form you want to embed and select 'Promote'. 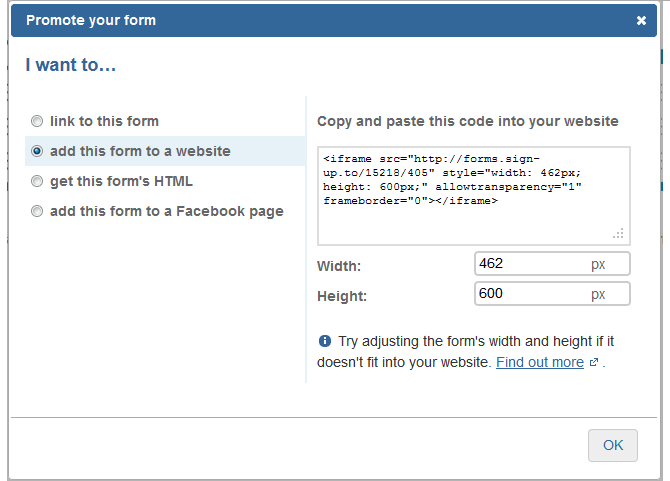 Clicking the 'Add this form to a website' option in the 'Promote your form' window will display the iframe code. Simply add this code to the appropriate section of your website HTML to embed the form. You can customise the size of the iframe to fit your form by editing the numbers in the height and width boxes. Alternatively if you want to build your form directly into your website and style it with your own CSS, click the 'Get this form's HTML' option to access the full HTML. If coding isn't your thing, you can quickly and easily add a data capture form to your Facebook page.